Good news! 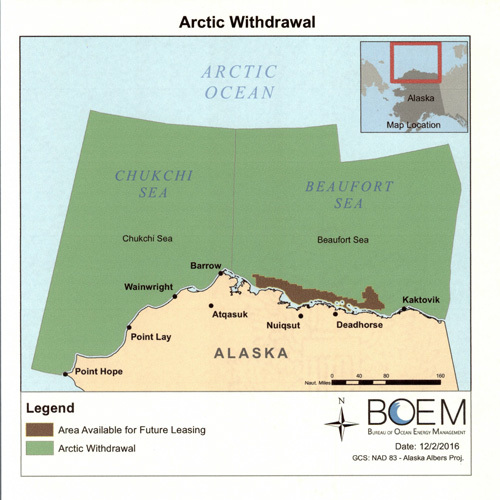 Thanks to President Obama, 98% of the Arctic Ocean was permanently withdrawn from oil and gas exploration. American history was made today. The conservation legacy of President Barack Obama was secured, recognizing that the Arctic Ocean is ground zero for the impacts of climate change, and an oil spill in such a fragile and pristine environment would be devastating to the wildlife and people who live in the region. President Obama understands that there are places where oil rigs don’t belong — the Arctic Ocean is one of them. That’s why today I’m thanking him for making the vast majority of U.S. waters in the Chukchi and Beaufort Seas off-limits to offshore oil and gas leasing – forever.